When Jo shared the exciting news about celebrating her sixth year of blogging at Jo's Scrap Shack, I began mentally paging through paper stacks, dies, and stamps to plan a special card. In my mind it was girly, floral, and layered with delicate cuts. In reality, the card I needed was to celebrate the May birthday of one of my favorite guys ever--my dad. I find masculine cards more challenging to make, but I am happy with the way this one turned out. The circular image was cut right out of the middle of a sheet from a Tim Holtz stack....love doing that, but I end up with some strangely shaped scraps! Thanks, Jo, for the privilege of being on the design team. I started designing for Jo's Scrap Shack on November 11, 2016, and I was thrilled to be able to create a Veterans Day card for my first post. I am constantly inspired by the team's creations and blessed by visiting the participants' blogs to see their entries each week. I love the layering! Great card for your Dad! I hope he has an extra special birthday! Oh such a gorgeous vintage card, Christine! 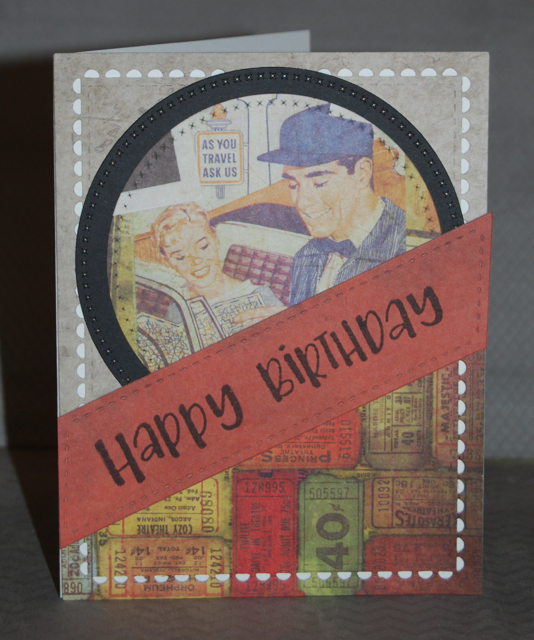 Love the retro mood and the different colors of scraps add more interest to the card, which turned out lovely masculine one! Thank you for joining us at the Simon Says Stamp Wednesday Challenge. I always love a great guy card! This is ideal! Thanks for playing along with us at PIP Challenges! Please tell your daddy that I said Happy Birthday and thank you for all you do for our team! Your work is so beautiful and inspiring! Great design!! LOVE your wonderful masculine card Christine. Cool design! Fantastic card!! Great job! I'm popping in from Jo's Scrap Shack's 6th anniversary celebration and I absolutely love your card! Your Dad will too! You found an awesome image - I love the vintage look! Thanks for inspiring! Wow! Awesome card! Beautiful layers and vintage look!